This is a quick and easy weeknight dinner. I'm always surprised how well this dish turns out every time I make it. Enjoy! 1. Season veal lightly with salt. Heat the oil in a medium skillet over medium high heat. 2. Add the veal to the pan, cook until it starts started to brown, about 2 minutes. Turn the cutlets and cook them until they're cooked through, about 2 more minutes. Transfer the veal to a plate and cover with foil. 3. 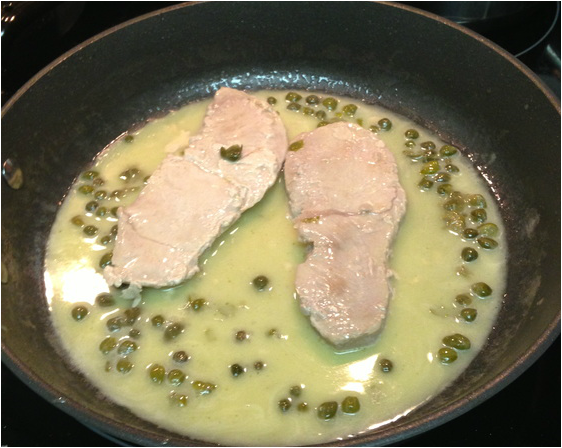 Add the capers to the skillet and let them sizzle for about 30 seconds. Add the white wine. Cook until the wine is reduced by at least half, about 2 minutes. 4. Add the lemon juice and stir to combine. Swirl in the butter, to make a sauce. 5. Return all of the veal to the pan to warm it up in the sauce. Drizzle some of the sauce over each cutlet. Serve immediately.